One of my best friend's name is Dotty. She is the one who walked me through every step of making my first quilt. But this post is not about her. And she is definitely not dumb! This is about Michael Miller. As in the fabric manufacturer, Michael Miller. He is the one responsible for my obsession fascination with selvages. I think I had always glanced at the words on the selvage. Sometimes they just had the name of the manufacturer. Sometimes they were interesting. Sometimes they made me chuckle. But I never cut them off and saved them. And then there was Dumb Dot, by Michael Miller. I remember I was working at the local quilt store when that line first came out. And for some reason, it just cracked me up. 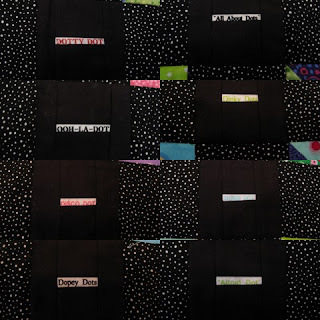 At the same time, I was doing a block-of-the-month quilt which used all polka dot fabrics. Going Dotty. That was the name of the quilt. 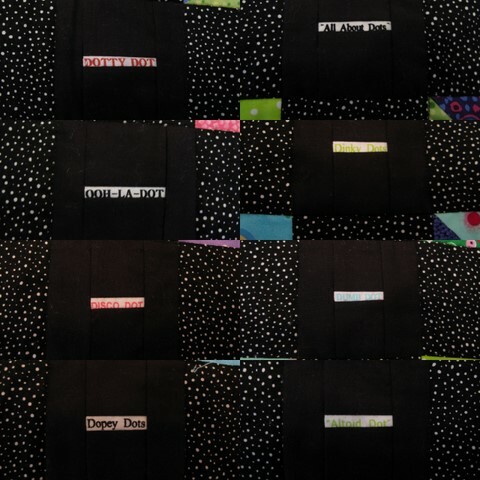 By then I had noticed several other fabrics with the word "dot" in them. A group of us went on a shop hop and for some reason it was at that point that I became obsessed fascinated with any fabric that had "dot" in the selvage. Michael Miller and Alexander Henry became my new BFFs, because not only do they give all their fabric interesting names, they nearly always give their polka dots a "dotty" name. On that shop hop I bought every fabric I could get my hands on that said "dot." Sometimes I got by with 1/8 yard. Sometimes I had to buy as much as 5/8 yard. Sometimes I didn't even like the fabric. But as I said, I was obsessed fascinated. Now what to do with all those selvages? Brainstorm. I would piece them into the sashing cornerstones when I put the quilt together. It's a really fun quilt. Bright and cheery. Fun all the way to the edge. Now I'm soooo beyond collecting just "dotty" selvages. But Mike and Alex are still my BFFs. I remember shopping for "dot" selvage edges with you! And, making our Going Dotty quilts together. You were BIT by the selvage bug for sure. I LOVE your Dotty quilt - it is SO fun and cheerful!!! That is honestly the most fun quilt I've ever seen! What a fabulous dotty idea! That is just too cute! I love an interesting selvage, but can never think of anything creative to do with them! I've been obsessed with any fabric with dots on it for the past year or so. I've had a hard time figuring out what to do with them all. This was a great idea! Here here!! Dot's are fantastic! I miss getting to look at that one on the wall all the time hehe!